Which icons do you like/unlike most in the new CRS4 homepage? 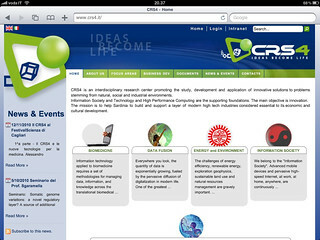 CRS4 is an interdisciplinary research center promoting the study, development and application of innovative solutions to problems stemming from natural, social and industrial environments. Information Society and Technology and High Performance Computing are the supporting foundations. The main objective is innovation. The mission is to help Sardinia to build and support a layer of modern high tech industries considered essential to its economic and cultural development.